This was the remark of Marie Tête-de-Bois, summing up her own life. She was perhaps the best known vivandière, one of the women who received patents from divisional generals to provide provisions for their men. With their wine, spirits, food and tobacco, their tents provided one of the few havens of comfort and conviviality in the otherwise bleak conditions of military campaigns. Typically they dressed in a modified version of the uniform worn by the unit they were associated with, a cut down tunic worn over the top of heavy wool skirts and sturdy shoes; but their ubiquitous mark of distinction was their canteen strapped over a shoulder. While some 19th century prints show romanticised images of vivandières as trim and jauntily costumed girls, in reality most of them were probably as hard as nails and about as feminine (Marie was nicknamed Tête-de-Bois because of her legendary ugliness). The nature of war frequently put them in harm’s way and the rigours of campaign were unforgiving particularly for an army in retreat. The horrors of the war in Spain and in Russia particularly drew no distinction between combatants and non-combatants and camp followers suffered terribly. They had to be tough and take every trial in their stride. 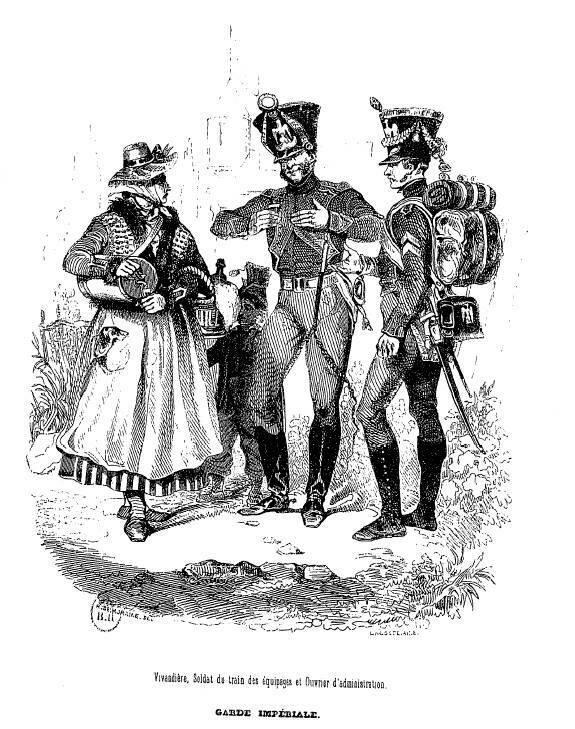 Catherine Beguin, a vivandière with the 14th Light Regiment once carried her wounded husband for two leagues (about six miles) on her back until she reached the field hospital. Marie Tête-de-Bois, pregnant at Marengo, gave birth near the battlefield. A passing soldier yelled, “Hey, Marie, you dropped something.” Her son would go on to become a drummer boy at the age of ten (this was common in many regiments), would become an officer and later be made a Knight of the Legion of Honour. They were brave too as the vivandières were not protected from the dangers of the battlefield. 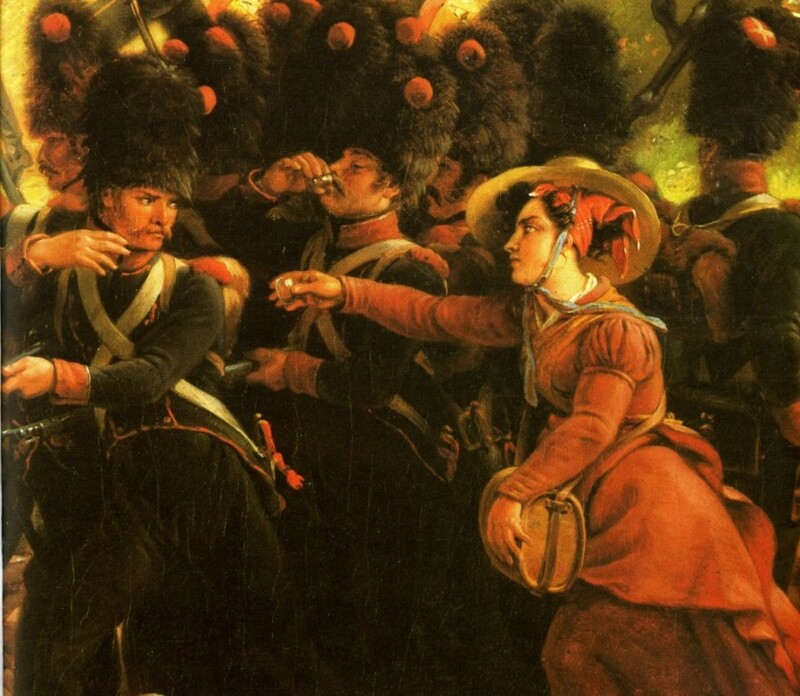 Catherine Ballard with the 95th Line Regiment, honoured by Lejeune in his painting here, received the Legion of Honour in 1813. 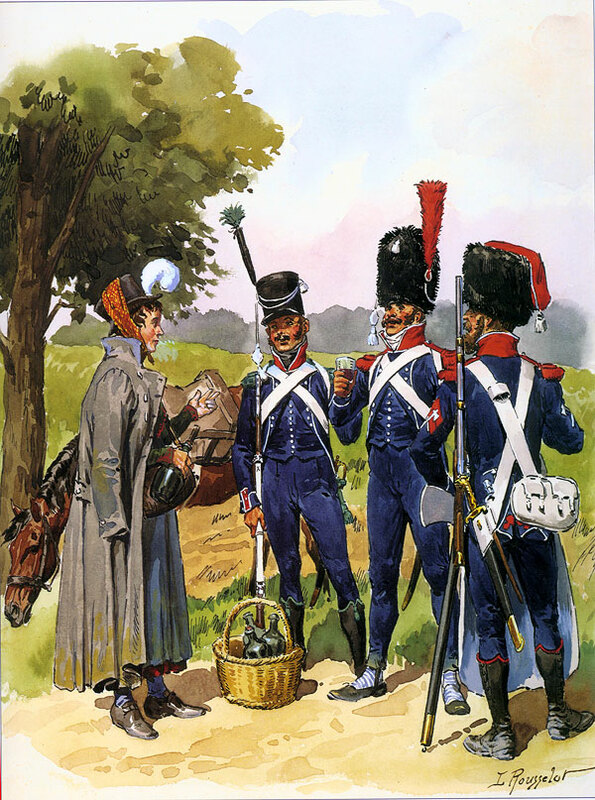 The vivandière of the 63rd Line Regiment was decorated during the Russian campaign of 1812 when she killed a Cossack and saved the life of the commander of the brigade. Elzear Blaze in his memoirs spoke of “the courage of these women which sometimes equalled that of the old grenadiers”. Inevitably some vivandières came too close to the fighting and became casualties. This was ultimately the fate of Marie. In fighting around Paris in 1814 her husband was killed and she was seriously wounded but she was back by the Hundred Days. At Waterloo she was serving with the 1st Grenadiers of the Guard in her 17th campaign with the army. Around 8pm, near the very end of the day’s fighting, she was killed by a cannonball.